During yesterday's Catalog University presentation, several attendees asked questions about Amazon. This is interesting, of course, because the focus of the presentation was really about how we in the catalog industry separated ourselves from modern e-commerce through a myriad of tactics that made sense in 1999 and 2003, but in retrospect, were not smart tactics and ultimately trapped catalogers in a demographically challenged corner. 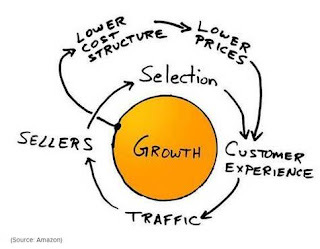 After sharing fifty slides of information, the audience referred back to this image above ... and began to ask questions about Amazon. I don't want to say that folks were blaming Amazon for cataloger struggles, because that was not the case. But if you take the four or five Amazon-centric questions and roll them together, you get a picture that attendees had strong opinions about Amazon. For instance, I mentioned that catalogers must, and I repeat must find ways to dramatically reduce catalog marketing expense, so that catalogers can be competitive and offer free shipping. At one point, I said something about Amazon, and was reminded that Amazon customers do not get free shipping - the customer pays for shipping up until a $35 hurdle - or the customer pays a hundred dollars a year or more for Amazon Prime. Let's go with the latter ... you pay $100+ for Amazon Prime, or you get free shipping with your favorite catalog brand. Think about the magnitude of that statement. The customer would rather pay Amazon to have merchandise shipped than to get comparable merchandise from you via free shipping. That goes against nearly every economic principle that exists, don't you think? To me, and this is simply an opinion that you may differ with, Amazon offers free shipping as part of a loyalty program. The loyalty program is Amazon Prime. And unlike all other loyalty programs that give away the farm, Amazon gets you to pre-pay for the right to buy from Amazon. It's exactly like a Personal Seat License that NFL teams use when they build new stadiums to rip off existing season ticket holders. You pay the team a fee, and that fee gives you the right to buy Season Tickets. Oh, sure, you can sell that Personal Seat License, but my goodness. Here's the thing about "competing" against Amazon. If a customer is willing to pre-pay Amazon for the right to have merchandise shipped quickly instead of being offered free shipping by a cataloger, then the cataloger is not competing against Amazon. Amazon already won. So why compete against Amazon? Stop it! I know, I know, the stuff you sell can be purchase on Amazon, so you are "unique" and "different". Sure. The time to "compete" against Amazon was in 2001, when catalog trade journals were mocking Amazon, counting the months until Amazon would run out of cash. Today, the cataloger has to fight a different battle. If you sell the same merch that Amazon sells, consider selling it on Amazon (I know, I know, you don't want to be an Amazon vendor. Ok, good luck). Tell a story. Any story. Amazon does not tell a story. Amazon is like the Costco store in the movie "Idiocracy" (click here for the video) ... "Welcome to Costco, I love you ... Welcome to Costco, I love you ... Welcome to ..." If you must send paper, use paper to tell a compelling story. Most important, going forward, catalogers are facing the three mega-trends. How will we find a new customer in 2020? How will we avoid paying tolls? An average customer age of 72-75 years old. +/- 10 Private Equity or Holding Companies who each own one-hundred catalog brands, and by doing so, have access to every Baby Boomer and older Gen-X customer, thereby putting the co-op business model out of business while making sure that they have access to the names that still buy from catalogs. Seriously. Use a little bit of imagination. That's where we are headed. So historically, we may have competed against Amazon - up until maybe five years ago. That battle is over. Catalogers lost. Going forward, catalogers are going to compete against each other. A Darwinistic battle is forming, one where a small number of businesses own a large number of catalogers, stripping HR and IT and Marketing and Creative and Merchandising fat out of the businesses in favor of centralized databases and merchandising synergies, using sister brands to find new customers - cutting the co-ops out of the process - eliminating tolls in the process. And by catering to a 70+ year old customer, catalogers avoid the tolls inherent in the online ecosystem. What comes five or six years after this is not pleasant to think about. This is the battle of the future. It's time to stop worrying about Amazon. That's a tactical process that cannot be won. It's time to think about that moment when ten Private Equity / Holding Companies own a hundred catalogers each. What does that look like? What's the end game in that situation? What happens to your thirty-year career in that scenario?